Length averages 22 cm (8.7 in), wingspan 55 cm (22 in), and weight 143 g (5.0 oz). Weight ranges from 88 to 220 g (3.1 to 7.8 oz). Females are larger than males and northern populations are notably larger than southern populations. Adults are larger than whiskered screech owls, with larger feet and a more streaked plumage pattern. There are several morphs: brown Pacific, grey Pacific, Great Plains, Mojave, and Mexican. All have either brown or dark gray plumage with streaking on the underparts. There is no red morph. They have a round head with ear tufts, yellow eyes, and a yellowish bill. Their appearance is quite similar to whiskered and eastern screech owls, so it is best to identify them by their calls. They were previously considered to be the same species as the eastern screech owl. The primary call is an accelerating series of short whistles at an increasing tempo or a short then long trill falling slightly at end. 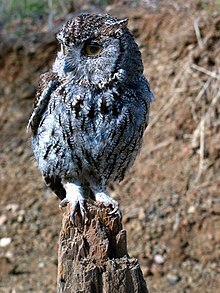 Other calls: barking and chuckling, similar to the eastern screech owl. They also make a high pitched screech. 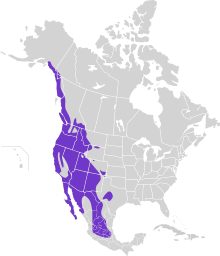 The western screech owl is native to Canada, United States, Mexico, Guatemala, El Salvador, Honduras, Costa Rica, and Nicaragua. Its habitat includes temperate forests, subtropical and tropical montane forests, shrubland, desert, rural fields, and even suburban parks and gardens. They are permanent residents of the northwest North and Central America, breeding in open woods, or mixed woods at forest edges. They often use holes in tree cavities or cactus that were opened by woodpeckers. These birds wait on perches to swoop down on unsuspecting prey; they may also catch insects in flight. They are active at dawn, night, or near dusk, using their excellent hearing and night vision to locate prey. Their diet consists mainly of small mammals such as mice or rats, birds, and large insects; however they are opportunistic predators, even taking small trout at night. Motion-activated cameras have photographed the birds eagerly scavenging a road-kill opossum. They have also been known to hunt Mallard ducks and cottontail rabbits, occasionally. Hatching of their young, usually four to five, is synchronized with the spring migration of birds; after migrants pass through screech-owls take fledglings of local birds. Wikimedia Commons has media related to Megascops kennicottii. ^ a b c BirdLife International (2012). "Megascops kennicottii". IUCN Red List of Threatened Species. Version 2013.2. International Union for Conservation of Nature. Retrieved 26 November 2013. ^ "Megascops kennicottii". Integrated Taxonomic Information System. Retrieved 4 April 2011. This page was last edited on 19 June 2018, at 21:29 (UTC).